In October, staff member Joshua Carpenter asked RPGamers to explore the balance of story and mechanics in RPGs. Persona 3: Dancing in Moonlight became a litmus test that solidified my personal stance that mechanics outweigh story. Dancing in Moonlight unabashedly offers little to no story, but does deliver on solid dancing and rhythm gameplay that seems best fit for a smaller screen. After playing the demo on a PlayStation 4 and large LCD screen, my eyeballs felt like they were bouncing back and forth like a tennis ball at Wimbledon. I settled on the more visually easy-to-digest Vita version. While Dancing in Moonlight feels like half a game, the half it presents is quite good. The vast majority of the nearly non-existent story is presented in the first five minutes of Dancing in Moonlight. The cast of Persona 3 wakes up in the Velvet Room to find Elizabeth has turned it into Club Velvet, a dance hall. She wishes to challenge her siblings, along with presumably the Persona 5 cast, to a dancing contest. Elizabeth assures the startled members of the Specialized Extracurricular Execution Squad (SEES) that they’ll all be able to dance splendidly just by thinking about doing so and to not worry about their current mission. It’s explained that time doesn’t pass in Club Velvet, and they’ll all awaken from sleep safe in their dorm rooms with no memories of what transpires. This is a thin premise that gets the SEES dancing and quite literally discussing nothing of importance for the next dozen or so hours. 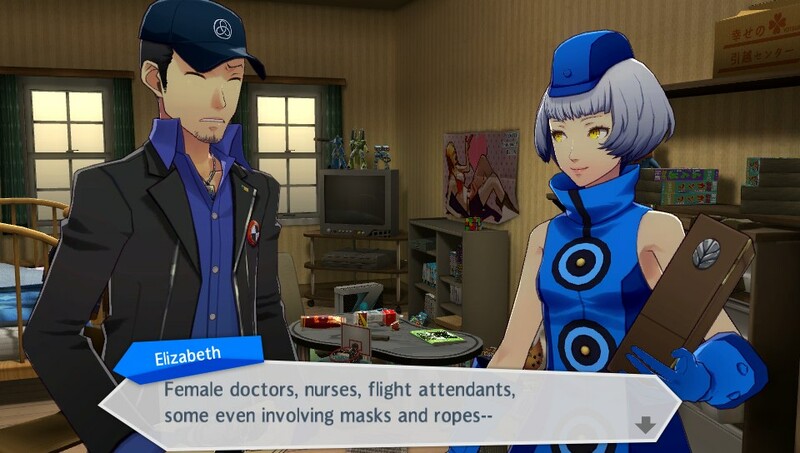 From this point on, all dialogue can be broken down into three categories: SEES members state how strange it is to be in the Velvet Room, they discuss practicing dancing to get better, or hint at their lives and experiences in the original Persona 3. 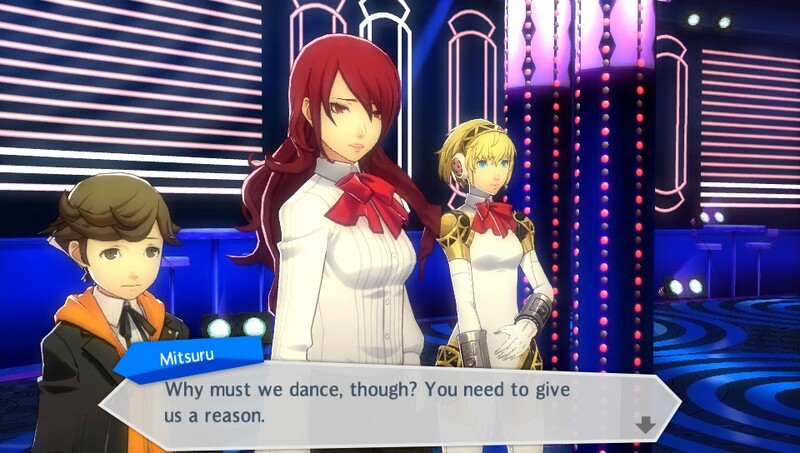 There’s a reason, Mitsuru, but it’s not a very good one. The remaining bits of dialogue that are doled out to players are done so during the Social Link portions of Dancing in Moonlight. Each character has eight unlockable and unmemorable scenes that play out as players reach various goals during the rhythm and dancing portions of the game. Watching each scene opens costumes and accessories to customize the SEES as they dance or unlocks various Support or Challenge options players can use to change the gameplay and affect the final score. The only mildly interesting element to the Social Link comes after characters’ sixth link is opened and players visit the characters’ dorm rooms. A hide-and-seek type mini-game is unlocked where players search the rooms for various playing cards hidden by Elizabeth that unlock even more costumes and accessories. It is surprisingly fun moving through and exploring every square inch of memorable locations from the original Persona 3. Aside from what’s described above, the remainder of the game is mostly rhythm and dancing, and this is where a game titled Dancing in Moonlight should and does deliver. The gaming mechanic will be immediately identifiable to those that have played Persona 4: Dancing All Night as it’s virtually identical. Notes fly outward from the center of the screen toward three locations on either side that are linked to the Up, Left, and Down buttons on the D-pad and the Triangle, Circle, and X buttons. Pressing the correct button as a note draws near can score players a Good, Great, Excellent, or Miss. Under normal conditions, only Great and Excellent presses earn players important combos. Notes can come as single notes, double notes spaced closely together, dual notes connected by pink lines across the screen, or scratches that use the analog stick. Getting into rhythm with the lyrics and melody of the songs is easy to do, and the button presses come naturally after playing for a bit, creating an intuitive, interactive experience. All of notes hit or missed affect the final numerical score that determines if a song is simply Cleared, done so Brilliantly, or reaches the King Crazy level. Things can get quite complicated on harder difficulty settings depending on the Challenge or Support decisions made. 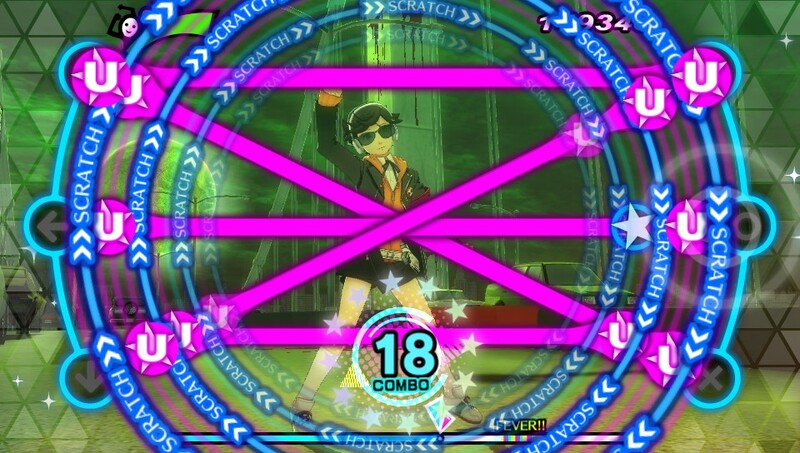 Many of the 25 songs that make up Dancing in Moonlight’s core gameplay star a single character and have a backup dancer or two that can join the action during Fever Time. Fever Time is activated during a few set points in each song as long as players hit the correct scratch beats in time. During Fever Time even Good notes count toward combos, something important to opening certain Social Links. Each song can eventually be played on four difficulty settings, although Challenge or Support options can be activated that allow an enjoyable amount of customization to the benefit of or at the expense of the final song score. After unlocking certain options, the easiest level of songs can be made incredibly challenging or the hardest difficulty can easily be cleared. These are great features that make the entirety of the game open to players of all experience levels. While Dancing in Moonlight does contain 25 songs, this is a number artificially boosted by multiple remixes of certain songs. Players will experience some of the same after completing three variations of “Burn My Dread” at four different difficulty settings, not to mention the other times it might be played to reach various Social Link goals. While the music is extremely enjoyable, it grows repetitive quickly. The small selection of tracks, combined with the lack of attempt at a concerted narrative, provides the feeling that this is simply half of a game, lending more understanding to Atlus’ focus on marketing the Endless Night Collection. Exploring dorm rooms is fun, especially when embarrassing items turn up. While the number of songs may be lacking in Dancing in Moonlight, the same cannot be said for the incredible graphics. First, the visuals on the Vita are just beautiful. They pop on the screen in so many bright, vibrant colors that are pleasing to the eye and fit the mood of an upbeat dancing game, which perhaps doesn’t gel well with the mood of the original Persona 3, but this is all a pretty dream. On the Vita screen, it’s easy to get a decent idea of the dance moves the characters are pulling off center-screen while still focusing on the moving notes around the edges. A fun option exists to watch a perfect run-through of each song if gamers would like to sit back and enjoy each dance without interacting. Each character has more than a dozen costumes to unlock, approximately seventy accessories, as well as different colored wigs and contact lenses. The game can be played in its entirety with characters dressed differently in each playthrough of every song, and players are encouraged to do so to open various Social Links. While the unlockable costumes and accessories run the gamut from recognizable from Persona 3 to risqué to ridiculous, players can enjoy a different experience each time songs are repeated during the grind sessions required to open ever more Social Links. A dancing game with a quarter of the songs that involve no dancing? Character outfits and accessories aren’t the only pleasing thing to look at in Dancing in Moonlight, the locations the characters dance in are mostly easily recognizable locations from Persona 3 or the Velvet Room dance club. Those add to the nostalgia this game can evoke from gamers that enjoyed Persona 3 and just want to spend some more time with its cast. While the locations can bring a smile to the lips of fans, the decision to not have locations, even not have dancers, for some songs is an odd one for a game with “dancing” in the title. Songs such as “Burn My Dread -Last Battle-“, “Our Moment (OP ver. 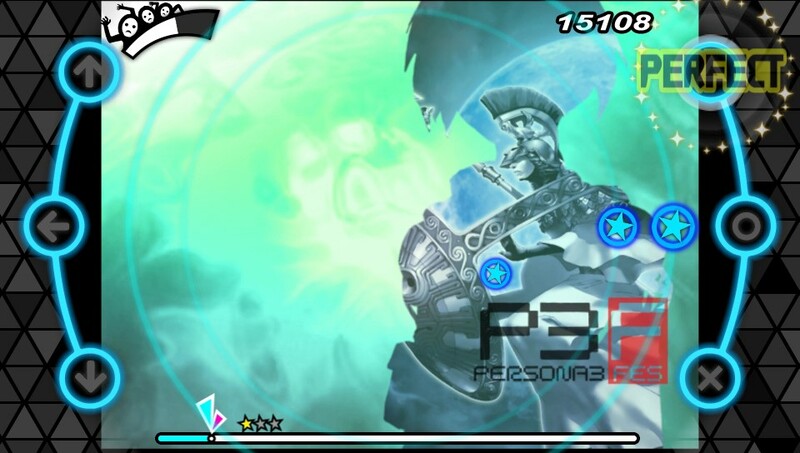 )”, “Moonlight Serendipity”, “Brand New Days”, and “Battle Hymn of the Soul (Daisuke Asakura Remix)” use static images or scenes from various of Persona 3 playing in the background instead of dancing characters. The song “Laser Beam” is just footage from a live Persona music concert from an arena in Japan. All told, that’s a full quarter of the songs in a dancing game that feature no dancing. While this might be interesting in a game with more content, it takes away from the total number of songs which each character is featured in this shorter game. Despite the limitations in game design, I thoroughly enjoyed my time with this restricted game. I easily overlooked a lack of story due to fun gameplay. The repetitiveness of the small musical selection are countered by the high-quality, enjoyable songs. The minority of songs that don’t involve dancing are countered by the fun options in the majority of songs that did. While it’s understandably a lot to overlook, a fun time can be had with Persona 3: Dancing in Moonlight, especially if gamers go into the game knowing just what they’re getting into. Engaging gameplay that encourages "just one more song"